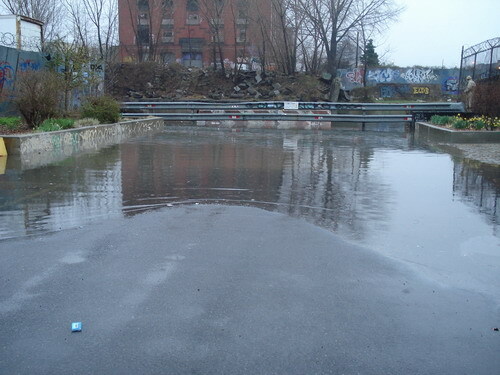 The Gowanus Canal did not disappoint yesterday. The pictures here show the Big G about one hour before high tide yesterday evening. 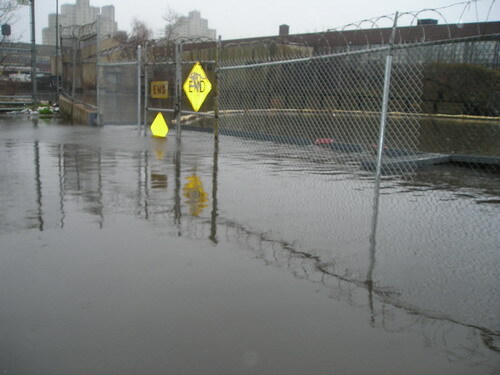 The photos show the canal overflowing its banks at Second Street (above)and at Sackett Street. The other photo shows it within inches of doing the same elsewhere an hour before the high water mark. Also bear in mind that during heavy rains like yesterday's, raw sewage flows directly into the canal, so that what you are looking at is (almost literally) crap in the streets. FROGG notes, "City Planning will be meeting with the community this Thu, April 19 to discuss changes in land use around here at the bottom of the Slopes." The meeting for those who are interested will happen at P.S. 32, which is located at 317 Hoyt Street, at 6:00 PM. 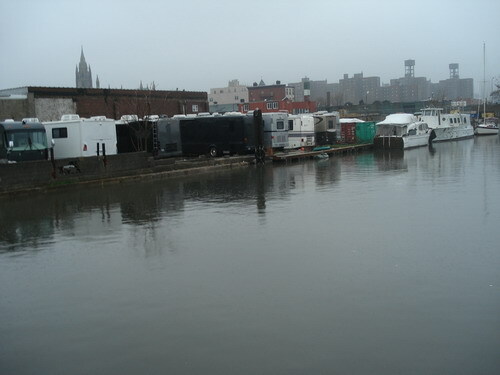 See also NY Times ohoto showing what was going on inside the houses up hill from the raising Gowanus. Like a lot of Gowanus Lounge posts, I'm not sure what you want the takeaway to be. That the canal is not a habitable area? OK. But what beyond that? Do you think it can never be made a habitable area? That it *shouldn't* be made a habitable area? I'd be more sympathetic to FROGG's agenda if it do often sound like, "Keep Gowanus sleazy so people won't want to live here!" My take is ...they've been trying to make it habitable for years...I've lived in the area for nearly 50 years...it is NOT as habitable as people want to think. I don't think it will be...not for a very, very long time. Not habitable--OK, and yet you've lived there for 50 years. So what's the problem with other people wanting to live there too, even building apartments and (gasp) supermarkets there? I would KILL for a supermarket around here. I don't mind people moving into the neighborhood at all, but I do wish they'd stop building garbage like those two buildings on Carroll Street, and I hope someone decides to upgrade the sewers at some point, otherwise in a couple of years we'll fondly look back and remember when the Gowanus didn't have poop floating in it all the time, just sometimes.